The profanity really spoils an otherwise good show. Not for me. why are you lagging on your review of the finale. Please hurry up, the world is waiting. By the way, whatever happened to Drea, cummin out of LA..
Am a looooong-time listener, way back to the days of Make Your Own Kind of Music with Scott & Steve, and the transitional period leading to the Dharmatastic years. Looking forward to the upcoming Colourcasts and a proper send-off to the best show on TV... Best potty-mouthed analysis on the interwebs! Why doesn't Ryan just do the podcast now? I can't stand losing this show when there are so few REALLY good Lost podcasts out there. I subscribe to 6 LOST podcasts and this is the only one that I never miss an episode of. These guys are hilarious. I would listen to them every day if they were on. Why would anyone really want to listen to the other podcasts that retell the ENTIRE episode of the previous LOST? I know what happened in the episode - I watched it. If I hadn't I wouldn't be listening to a podcast about the f*%$ing show!! Thank God for The Dharmalars. Otherwise I would be stuck listening to one of the billions of LOST podcasts that include a group of people mundanely talk about what they thought of the GREATEST SHOW ON TELEVISION. To all other podcasts: it's called entertainment people. Take a lesson from these guys and learn how to do that. The only cool guys out there doing a Lost podcast. Simply the best LOST podcast on iTunes. Don't waste your time with the other LOST podcasts. I like these guys, they make me laugh. I don't compare them with the other podcasts, I think they are in a different zone. They just kinda of talk about different things and Lost just kind of makes it's way into the conversation. I must say they are at their best when they are discussing the show. These guys know their stuff. You need to listen to at least two podcasts before you cast judgement. I'm tuning in every week! Ben and Ralph do a funny recap of the latest episode and come to even wackier theories than Jay and Jack. Although they get of-topic sometimes, this is still one of the better LOST podcasts, and I enjoy listening to them. did not enjoy this podcast at all. how long can you listen to two guys complain? first about their DVRs then about the enhanced episodes of lost which are obviously not geared for fans to watch. When Did Jay and Silent Bob Start a Podcast? Seriously... I feel like I'm listening to Kevin Smith and Jason Mews geeking out on Lost, but there's oh so much more! They wax un-poetic on the coolest movies and television shows of all time, reference references and use a lot of neat swears. Hell, these guys even make Karaoke fun again! This is likely the funniest podcast about the TV show Lost. There is no recap. Despite the nontraditional aspect that they use Ben and Ralph usually have mose insight than many other podcasts, and they're funnier than most. This is a perfect podcast for those who suffer from A.D.D, like myself. Who likes linear thoughts anyway? (and) The only reviews they read about themselves are the bad ones. Hi Ben and Ralph. Why? They're funny and have good insights. Finally found a show where there seemed to be intelligent discussion about LOST theories, as opposed to other lame podcasts. But then of course there's always a trade-off. These guys can't go too far into the show without cursing up and down, which detracts heavily from the first impressions of intellect. Try getting through a show where those of us who don't resort to crude speech can fully enjoy what you have to offer. With Ralph and Ben, you can't go wrong! Ever since Jay and Jack first mentioned these guys, I've been a fan. They have such funny banter between the two of them, whether they're talking about LOST or are in hiatus mode as "The Lars". Either way, it's always a treat to listen to them! I am not sure if these guys even watch the show! ( My example: in the season 4 finale, you ask, "did bentham visit anyone off island?" Duh!! Jack, Kate AND Walt all said he did----how come you two could not remember that???) I decided to give these guys a try while LOST in on a break. The two guys really don't review much of the episode. There is no research from previous episodes unlike other LOST podcasts. The recall of detail in the show is weak. While their predictions are good, I would like to actually see more in-depth review. After listening to a few episodes, where I knew more detail from the show than they did, I will never listen again. You gotta love the Dharmalars! They are hilarious. Their banter is witty and their Lost talk is great. Subscribe! You wont be disappointed!! Give this one a listen! These are the type of guys you want to hang around with. Very funny and enjoyable to listen to. I even like all of the bull they talk about that has nothing to do with LOST. And I love the dude in the background who laughs at EVERYTHING. i don't really like this podcast but I can't stop listening to it... so a 5 it is. Great podcast. Ben and Ralph have great chemistry and have great banter throughout the whole podcast. Oh yeah they talk about Lost sometimes too! Off-topic at times, but informative while being entertaining. For those of you who like a full recap of the previous episdode, interactive listener feedback, and overall lameness, this podcast isn't for you. But for those of you who like the randomness and funny wit, while still maintaining to talk about our favorite show effectively, this is your lucky day. And a plus for the music score fans out there, The Dharmalars (almost) weekly talk, in detail, about the musical score to the show and make their own theories and predictions from it. Don't worry if you aren't into muscial score, I wasn't to begin with either. But after just a few segments from Seatlle Jimmy, I was hooked and started noticing score everywhere. Yes, they do talk about what's going on in their own lives and make references to other pop culture critera, but I personally believe that is what makes this podcast one of the best: the human element. It reminds you that these are real people with real lives taking their own time and pumping their own money into the show. This guys aren't being paid to do this show (though I think I gladly would), but they still crank them out weekly, even when Lost isn't on. So why not let them have a little fun and talk about other things than Lost? So in conclusion, if you don't like entertaining commentary about Lost, rambling, and overall awesomeness, go listen to Jay and Jack or someone else. (Not slamming them, they just do a more in-depth show). Listening to this fragmented mess of a podcast is like listening to outtakes from a Miss Teen North Carolina interview. I personally believe that US-Americans can surely find a better LOST podcast, such as. And without a map, because South Africa needs help, such as, a better future...they need the maps. Nothing against these guys, but they need to develop this thing more before uploading - maybe do some show prep, make notes, plot their thoughts, take some deep breaths. Not your average Lost podcast! This is a great Lost podcast. It's not your average boring discussion about the show. Ralph and Ben get off topic a lot but that is what makes the show. Keep up the good work guys! I gave this one a shot for quite a while, but I can't make it through their immature banter to make it to the part where they talk about the show. Too bad since that part isn't all that bad. "I'm Done with you Wackos"
Hilarious. Entertaining. Out there. Of all the LOST podcasts this is the one that I can't miss. Some of the theories are crazy but hey-they stick to them. I really like the background music too except when they try to sneak in a Backstreet Boys song....but what can you expect from "frat boys." Actually they are the complete opposite of your typical frat boy so whoever said that needs to listen to the show every now and then. It's not so much a podcast about lost, as a podcast that talks about lost. But, Ralph and Ben's reference....references are great. These guys are fun, and different from any other lost podcast out there. 1 of 3 Podcasts that Max Out & Rock Out dudes!!!! Awesome podcast. Keep on rocking dudes. Love the karaoke!!! then you will HATE this podcast. I love the dharmalars. Are they the most professional of podcasts? no. But that's why it's great. It's Smodcast crossed with Jay & Jack. Subscribe. One of my favorite podcasts. Granted, I did listen to it during the show's hiatus, but even then would it be too much to ask for to actually mention the show? They discussed movies, sports, their lives, anything but LOST itself. If I wanted to listen to a couple of frat boys bs for an hour, I am sure there are other podcasts i could go to. There was even a point in their conversation where a LOST reference would have been PERFECT, and they failed to deliver. Stick with the dozens of reputable LOST podcasts out there and pass this one by. I been on to this podcast since they put there 1st show on , there mad funny and they give stuff away you could win, try it you might find something about yourself i sure have. I love Ralph and Ben, they are so funny. I think it's good they don't recap the show because if you listen to a lost podcast it's very likely you listen to more than one and there are plenty of recaps out there. I like it when they just joke around and talk about what they've been doing .... and then talk about their reaction to Lost. Also, I like Ralph's "Further Instructions" theory he almost has me believing too. This theory alone is worth subscribing to the Podcast. Absolutely hilarious. Ralph and Ben keep it real and bring their own brand of humor plus some great insight into the Lost score. After listening you'll wish these guys were the sweet couple next door. Out of all the LOST Podcasts I listen to (5 in total) the Dharmalars are by and large my favorite. I've been listening to the Dharmalars for over a year now and have yet to be disapointed by a single episode. Ben and Ralph are extremely entertaining with their banter, self-deprecating humor and numerous pop culture references, and Seattle Jimmy is always enlightening on his take of the show's score. These guys are what kept me sane throughout the haitus between seasons. Do yourself a favor and subscribe to this podcast NOW! Great humor for the right people. Oh, and interesting theories about Lost. I listen to a bunch of LOST-related podcasts and the dharmalars are my favorite. These guys feel like friends to me despite the fact that they live across the country and we've never met. Their analysis is good and, most importantly to me, they're entertaining. I always look forward to listening to their podcasts after a new episode of LOST airs. Boring, poor humour, no episode recap, alot of talk about things other than Lost. What more can be said. Stay away from this one. To quote Mr. T.... "Jibber-Jabber"
Terrible. Don’t waste your time on this slack-jawed rambling. These guys spent far too much time whining about poor iTunes reviews, deciding what a joke is and what a reference is, and how their podcast compares and ranks with others. Then there is some mope who discusses the soundtrack and makes dimwitted comments such as “I thought the splash sound should have been louder when he jumped into the water.” C’mon! Ralph and Ben are two regular guys riffing on Lost and whatever else comes to mind. Dharmalars is a more laid back Lost podcast for people with a sense of humor and a love of pop culture. If you are up tight, this is not the podcast for you. Dharmalars is a good bookend to the Jay and Jack podcast. Jay and Jack give you all the over scrutinized details while Ben and Ralph give you details with humor and profanity. I love the show Lost. I read five or six reviews each "morning after" and I look for blogs and I scramble for information and I always enjoy all the many, many theories and fan reactions. This podcast, hands down, is my FAVORITE source of information on the show. I love the tone, feel and flow of it. The musical reviews are oustanding and very, very informative and entertaining. The calls, frankly, are one of my favorite parts of the podcast. It reminds you that while we might be Lost, we are not ALONE. 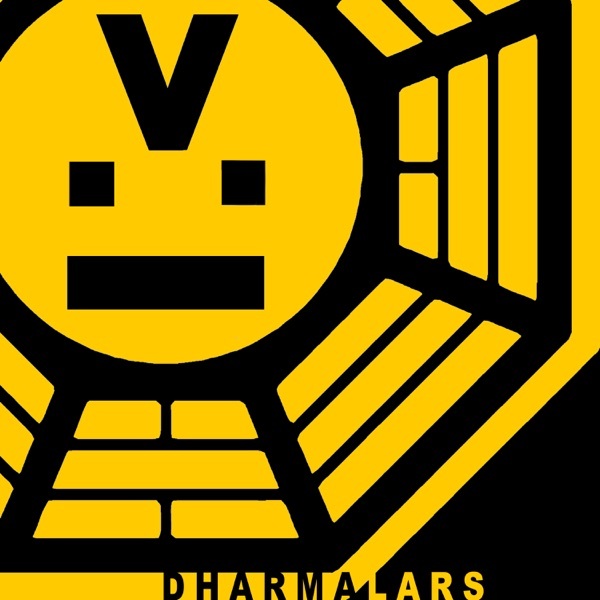 Dharmalars present an entertaining look at the tv show Lost. If you're looking for a dry, by-the-numbers recap show, there are plenty of better examples in the Lost podcast universe. However, if you want to listen a smart, funny take on the show this podcast if for you. Ralph and Ben never profess to be Lost experts, merely passionate fans who also have other interests. The show is broken into chapters so it's easy to skip the rambling introductions to get to the meat of the podcast. I listen to many podcasts, and this one is one of my favorites. Keep up the good work guys! You rock! These are just regular guys watching an irregular show,and by irregular I mean great. Lost is one terrific show that has captured my imagination and these guys have taken it to a new level by helping me figure out what the heck is going on and helping put things in perspective. Like any of us can actually figure out this show.They are also funny...and by funny I mean like a clown funny.